A BRITISH couple have had their home part-demolished in a bitter row with a housing developer. Peter and Jan Wooll, who live near Torrevieja, looked on in horror as their garden and surrounding wall was destroyed by building company Meraban. The couple, who are originally from Hampshire in the south of England, said they have been in dispute with the company for two years over claims the ground around their three-bedroom villa is subsiding. Things came to a head on April 4 when a representative of the developers, who claim the property still belongs to the company, knocked down part of their home. “I had just left for work when an excavator started to knock down the garden wall,” Peter, a 53-year-old plumber said. “Jan was in ill in bed when she heard a crashing sound. She woke up to find part of our property gone. She telephoned me to tell me and I rushed back to find a pile of rubble but no sign of the builder. The problems began in 2004, when the couple bought the off-plan villa in the exclusive Lo Crispin development in Algorfa, 30 kilometres south of Alicante. Promised it would be ready by April the following year, the couple relocated to Spain from their home in Fareham. However when they arrived, they were told the property would not be ready for another six months. “We lived in rented accommodation until November 2005. We had to leave that so the builder allowed us to move into the house, although it was unfinished,” Peter told the Olive Press. Weeks after moving in, a major water leak caused subsidence around the house, leading to huge cracks appearing in the walls and patio. The developers promised to repair the damage, stating they would tile over the garden to prevent any further subsidence. The Woolls claim neighbouring villas had experienced similar problems and the proposed repair work had failed to correct the problem. An architect employed by the couple discovered the ground upon which the 360,000-euro house had been built had not been adequately prepared prior to construction. 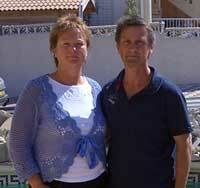 To compound the problem, the couple claim the house is not yet theirs despite paying 260,000 euros to the company. “We made two arrangements with Meraban to meet at the notary office to pay the final installment and complete the paperwork. The first time the company failed to show, the second they did not bring the correct documentation. “In March 2007, we started proceedings against Meraban and have been waiting patiently for the legal action to take its course. We want to ensure any repair work is correctly carried out. If they are unable to do so, it seems reasonable they return any money paid and we withdraw from the contract,” Peter said. Confirming the demolition, a company spokesman said: “The house does not belong to them. It is still registered in the company’s name and this couple still owe us 122,000 euros,” spokesman José Guiterrez said. “We have taken legal action against the Woolls to evict them until they pay this outstanding amount. We know the law in Spain is slow, so we did this to try to force a solution and get the case heard by a judge more quickly. “I am sure any legal decision will be satisfactory for all,” he added.